Students in the Lower School celebrated the end of the fall Box Tops contest. They brought in 6776 Box Tops this fall! In honor of Clemson's overwhelming victory, Mr. Critcher wore a Clemson shirt all day. Our top 3 students for this contest were Joel Goldberg - 1st, Addison Herndon - 2nd, and Lincoln Kinard -3rd. Our YTD total is $1,122.70 - way to go!!! Our top participant in this fall's Box Top contest was Joel Goldberg, who brought in 1330 Box Tops!! 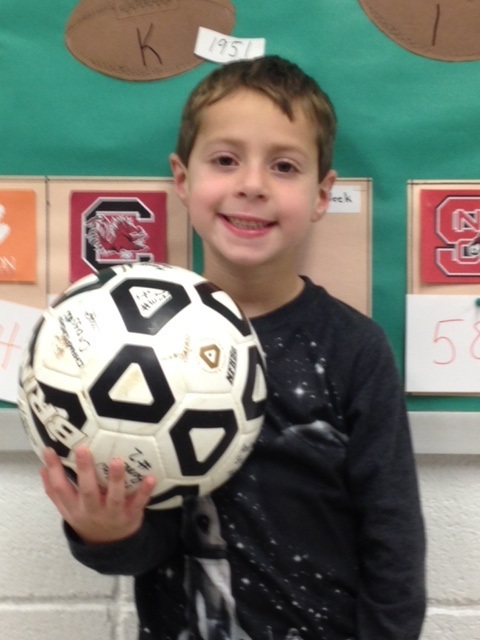 He received a soccer ball signed by the members of MA's 2015 State championship soccer team! Good job, Joel!